Byron Vinson and Taron Small are both being charged with murder, conspiracy and weapons-related offenses, Philadelphia Police Lt. Norman Davenport said. 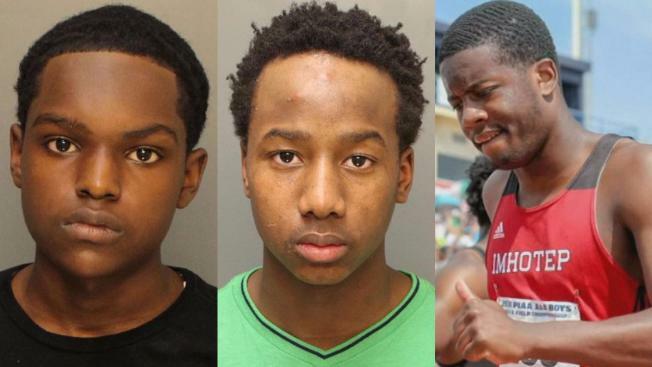 Police arrested two teens in connection to the murder of a rising Philadelphia track star who died the same day he was set to attend Penn State. Two teens were arrested Wednesday in the brutal killing of a Philadelphia high school track star who died the same day he was set to begin his freshman year of college, investigators said. 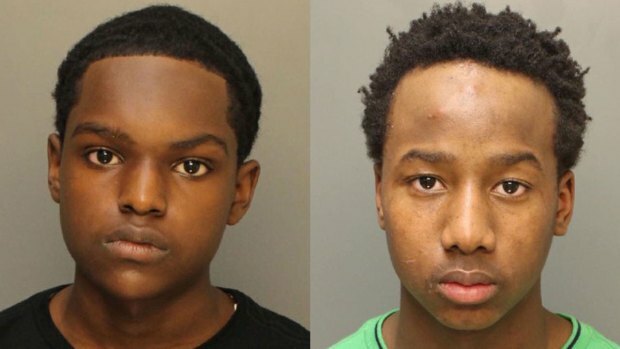 Philadelphia police first arrested Byron Vinson, 15, then later arrested Taron Small, 16. They were taken into custody one week after 18-year-old Kristian Marche was gunned down Aug. 13 outside his home in the West Oak Lane neighborhood. Vinson and Small are each being charged with murder, conspiracy and weapons-related offenses, Philadelphia Police Lt. Norman Davenport said. (L to R), Taron Small, Byron Vinson. See larger photo here. The Philadelphia District Attorney's Office approved adult charges for both teens, spokesman Ben Waxman told NBC10. Marche, a rising track star at Imhotep Institute Charter High School, was shot once in the head on Aug. 13 and died the following day. "It just boggles the mind," neighbor Edward Byers said. "It's inconceivable to think that young kids like that are running around with guns shooting people." Police said the ordeal unfolded while Marche was at home with his mother. He heard a noise in the back of the house and went outside to investigate. Marche saw at least one of the teens jump down from the second floor of the home, Davenport said. Police suspect Small and Vinson, who both live in West Oak Lane, were attempting to break into Marche's house. Video obtained by police showed the three teens walking together in a neighbor's driveway shortly after Marche confronted the would-be robbers, police said. Marche was walking between the two suspects when Small allegedly shot him once in the back of the head. "This was not a struggle. This was not a fight," Davenport said. "This was a clear case of murder." Police sources described the killing as one of the worst to be captured on video, calling it "brutal" and "horrible." Several detectives teared up during the course of the investigation, Davenport said. Attorney information for Vinson and Taron wasn't immediately available. According to statistics released by Philadelphia police, 2018 has been an especially violent year for teens. Fourteen people under the age of 17 have been killed this year alone and there have been more than 70 shootings involving minors. This marks a four-year high, according to Philadelphia police. "I wish I could stand here today and say that with the arrest today it will be the end of teen violence in the city ... but I don’t think it will," Davenport said. "Something needs to be done." Those who knew Marche were heartbroken over the loss of a talented athlete with big dreams and potential, loved ones said. Marche excelled in both football and track and field. Marche was so good, in fact, that he was set to attend Penn State University on a track and field scholarship. Last Tuesday would have been Marche’s first day of college. Marche was also described as a friendly and funny teen who got along with everyone. Imhotep Institute Charter High School's football team is dedicating their upcoming season to Marche. A scholarship in his honor is also being planned.